Kerala Polytechnic admission 2015-16 online registration details are given here. Find here the Kerala Polytechnic Admission online application 2015 and single window registration method. The Kerala Polytechnic Admission 2015-16 Single Window System (SWS) 2015 online registrations will start from 26th May 2015 at the official website. Candidates, who are seeking admission to the Kerala polytechnic diploma courses, can find details regarding the Polytechnic Colleges and branches at www.polyadmission.org. 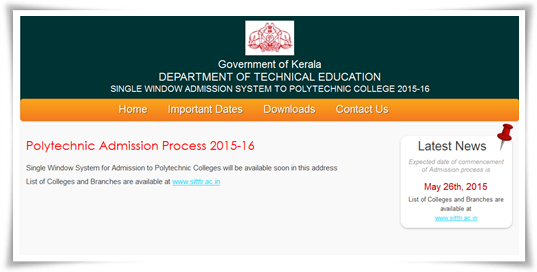 The Kerala Polytechnic Admission 2015-16 Single Window System (SWS) 2015 online registrations will start from 26th May 2015 at the official website. The admission is meant for various courses including Diploma in Engineering/Technology and Diploma in Commercial Practice / Management for the academic Year 2015-16. The 3 year diploma programme which consists of 6 semesters is based on the credit based semester pattern. Centralized Allotment Process (CAP) is done through the Single Window System (SWS). The Centralized Allotment Process (CAP), the Single Window System (SWS) is an arrangement made to give allotments to the various academic programmes offered by the Polytechnic Colleges in each district. The allotment is conducted on the basis of the options submitted by the candidates. Candidates need to register options only to those programmes / colleges which they are sure to join during the allotment. Students who have passed SSLC/THSLC or equivalent examination with eligibility for higher studies are eligible to apply for polytechnic course during the current academic year. For CBSE / ISCE candidates, the marks or grades obtained in Science shall be considered for calculating grade in science in the place of subjects Physics and Chemistry. Before applying the courses, candidates need to gogo through the prospectus which will be made available at the website 'www.polyadmission.org'. As the applications can be submitted only through the online portal, help desks with internet facility in all the 49 Polytechnic Colleges will be available. Complete details regarding the online application procedure, publication of the provisional rank lists, counseling and commencement of academic session will be published through a notification at the official website. It is very important to keep an eye on the website to get updates about the admission process and important dates. Students can apply for the polytechnic courses offered by the directorate of Technical Education by visiting the official website.